Goodbye teen dreamboat, hello young adult heartthrob. Shawn Mendes, our second favorite young Canadian charmer, has gone and released the drama-filled video for “Treat You Better” and it’s without a doubt his best video to date. “Treat You Better” undoubtedly follows in place of his huge uptempo, guitar-led hit “Stitches.” The latest released song however has a noticeably glossier pop production than its more organic sounding predecessor. Where “Stitches” was no doubt Shawn’s most radio-friendly song to date, “Treat You Better” sounds like a song to cap off an arena tour date. The music video’s much more mature than what most of us probably would have expected from Shawn, instead of the typical jealous third wheel storyline, it displays a powerful message for abuse victims, even ending the video with the National Domestic Violence Hotline’s number. Shawn plays the protagonist frustrated over seeing his love interest being involved with a physically and emotionally abusive boyfriend. A powerful and striking video, cut with frantic scenes with a dark atmosphere not unlike that of buddy Taylor Swift‘s “I Knew You Were Trouble.” A strong statement and a noteworthy step in Shawn Mendes’ evolution. Oh, and of course I suppose for our teen readers we should mention there’s a little shirtless scene going on as well. The boy is less than one month away from turning 18 (August 8) and it looks like he is his label is fully aware of just how marketable his look is — abs and all. 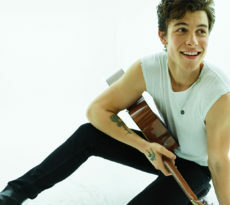 Shawn is coming of age and becoming a force to be reckoned with and has all the ingredients of a budding pop icon: looks, charm, talent, heart, the whole package.